Crack kills—everyone knows that. And most people know they shouldn’t do drugs. But in our blogging/writer community, drugs are not our greatest enemy. Instead, it is the dark horse lurking about seeking to devour anyone who will turn their attention his way. And left unrestrained, I submit to you: COMPARISON KILLS. 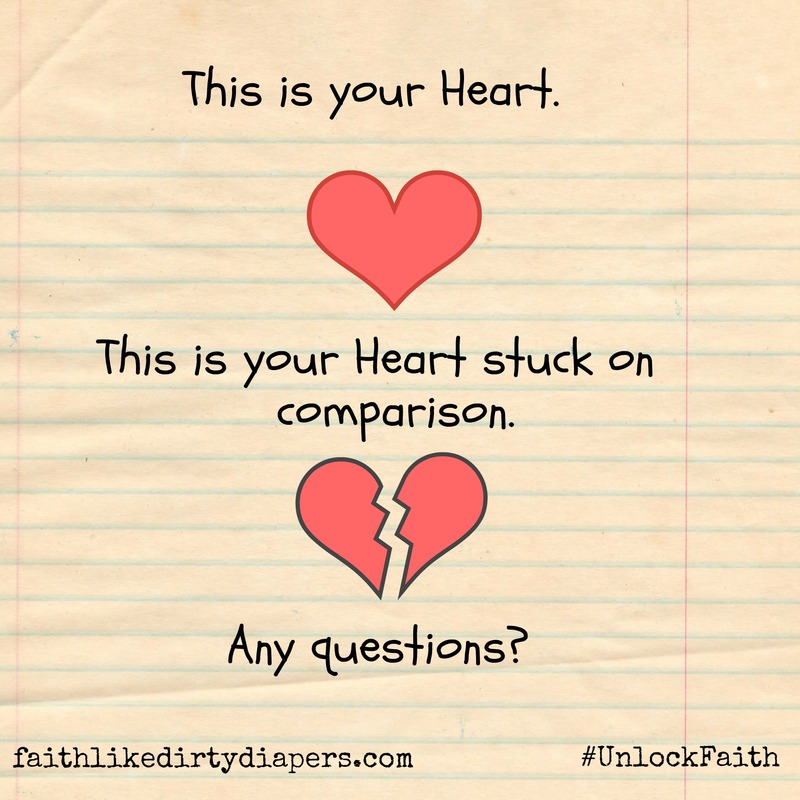 Comparison shows up at our doors on those dull days when we decide to peek around the sides of our Savior to see how everyone else is doing. But she’s got 2300 followers. I have 30. But this chick gets to speak to large arenas of people. And I haven’t spoken since…when was that, actually?? But nobody reads my stuff. So, why even bother? Why keep going? It is such a sacrifice to write and all of 20 people read it? Maybe? You don’t really have anything to say anyway. Besides, she says it better and has a lot more readers. Just let HER carry the torch. You aren’t even that great of a writer. There are others who ‘nail’ it. You aren’t one of them. Maybe some of it is true, and maybe not. The thing is that the word of truth is in me. These words that burn with the passion of gospel have to come out. True Story: I never wanted to be a writer, I just AM one. It is something God put within me and no amount of lies or excuses release me from His plans for my life. The lies and “buts” of comparison must come to a STOP. Insert squealing tire sound here. 1. I want to be recognized. I totally HATE that it always comes back to this: I want to have a “name” with lots of people who listen to me. Just when I convince myself recognition doesn’t matter to me, the comparison monster shows up at my door with nasty drool stringing from his jaws. I am a proverbial glory stealer. All glory and honor and power belong to God and God alone (Rev. 4:11). Why am I trying to get my hooks into any of it? Ridiculous. Even if it ever felt like “mine” it would never truly be mine. Plus everything is all about Jesus. Why make it about me? I’m nothing without Him. Success has become a farce in many ways for the believer. The “if you build it they will come” philosophy is sinking its sharp talons into our minds. Success is frequently reduced to a game of numbers, programs, bells and whistles. Can success include these things? But is true success in ministry more than all these things? Jesus didn’t build programs, write books or have a booming blog. Jesus told people the truth. And if anyone evaluated the ministry of Jesus based solely upon our common definition of success, He would be considered a failure. How often do we look around and think we have to do what everyone else is doing? How often does that result in doing our own will as opposed to God’s? Bottom line? True success is knowing and doing the will of God out of a heart of love for Him, then sharing His truth with others. If it results in zero, one or 20 people that come to Him (not US), we can always rest in the fact that it is God and God alone who gives the increase. We need only be faithful with His words. You do what you do. God equipped you uniquely to serve Him and to minister to particular people in a particular way. Your equipping is not mine, and vice versa. Extinguish the “but” darts of comparison before they extinguish you. And.Extinguish the “but” darts of comparison before they extinguish you. Perfect- I am right behind you on the livefree link up and I have been meaning to visit your blog from our iron group 🙂 I love what you are sharing here and I totally get where you are coming from. Yes- why bother is what I think at times as well… but those are toxic thoughts that help no one 🙂 I am happy that you are pursuing your calling and you are making a difference! God measures differently and continually invites us to reframe our reality. I am grateful for your honest and encouraging words! Write on- sister. Comparison kills and steals so much joy. I’m glad you wrote about this. Good stuff. And I’m glad you linked up at #ThreeWordWednesday. “Comparison shows up at our doors on those dull days when we decide to peek around the sides of our Savior to see how everyone else is doing.” This is great!! I appreciate you linking it up with us at Grace & Truth!